According to Warangal Police Commissioner Dr V Ravinder, a Hyderabad-based businessman allegedly sent Rs 1.5 crore to Nama Nageshwara Rao, Rs 2 crore to Vaddiraju Ravichandra and Rs 2.3 crore to Konda Murali. With Telangana just days away from the polls, the Warangal police have seized Rs 5.80 crore in cash. Authorities said that the cash was allegedly brought to the area to influence voters in Khammam, Warangal East and Parkal Assembly constituencies. On Tuesday, Warangal police at Pembarti check post, found a car which was allegedly carrying cash. A statement from Warangal Commissioner of Police, V Ravinder said that the sub-inspector from the Janagoan police station seized Rs 5.80 crore and arrested three persons including the driver of the vehicle. According to reports, the police suspect that the money was sent from Hyderabad by a businessman named Kirti Jain to Telugu Desam Party's (TDP) Khammam candidate Nama Nageshwar Rao, Warangal East contestant Vaddiraju Ravichandra from the Congress and MLC Konda Murali to allegedly influence the voters. 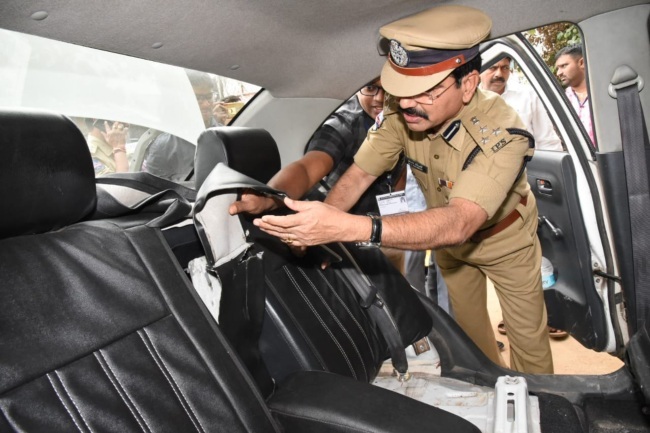 According to Police Commissioner Dr V Ravinder, the Hyderabad-based businessman allegedly sent Rs 1.5 crore to Nama Nageshwara Rao, Rs 2 crore to Vaddiraju Ravichandra and Rs 2.3 crore to Konda Murali. As of December 3, the EC said that it had seized Rs 94.17 crore in cash out of which the police department seized Rs 71.67 crore and the Income Tax Department officials seized Rs 22.50 crore. The EC has also seized 4.79 lakh litres of liquor worth Rs 9.62 crore and Rs 7.77 crore worth of other items such as gold, silver, ganja and gutka. Earlier this week, the EC said that money and mafia were playing a vital role in elections, with Chief Electoral Officer (CEO) of Telangana, Rajat Kumar pointing out that the cash seized this time was already Rs 28 crore higher than the total amount seized during the last elections which had covered united Andhra Pradesh.